Welcome to the Blog! I'm Erin Solomon, a life coach and former practicing attorney based in Chicago, Illinois. 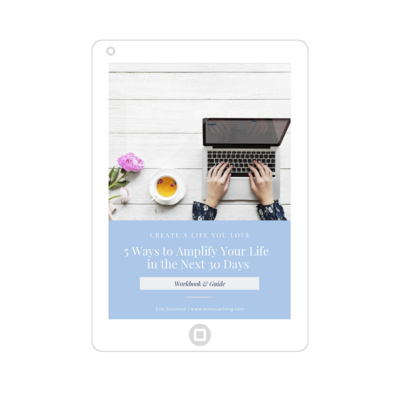 Here, you'll find practical strategies and encouragement for living your best life - an authentic, joyful and peaceful life on your terms. If you're ready to hop in the driver's seat and create a life you love, you're in the right place! I hope you'll grab a cup of your favorite coffee or tea and join me! Want personalized guidance? Schedule your free coaching consultation today! Plus be among the first to know about special offers, new programs, and resources. Get exclusive free tips & encouragement in your inbox! If you feel like you hold yourself back from doing some of the things you know would move you forward, this post is for you. Whether you want to start a new business, launch a new product or service, be more visible, or even just speak your truth in a bolder way, it can be frustrating when you see yourself resisting or avoiding some of the very things you know would make the biggest impact toward your goal. I know… I’ve been there!! Maybe you avoid doing the thing altogether or you stay busy with “safer” tasks and never get to the few things you know would really move the needle forward and have the biggest impact. Or maybe you’ve taken some bold action recently and now you’re having a mini freak out, wondering if those fears are a sign you should run straight back into your comfort zone. Why do we do this? Well… usually because it’s comfortable! On the other hand, that bold action you’re avoiding? Probably not quite so cozy and comfy! Doing those things likely means pushing yourself outside of your comfort zone. I remember awhile back when I knew I wanted to show up in video more often but I resisted it. 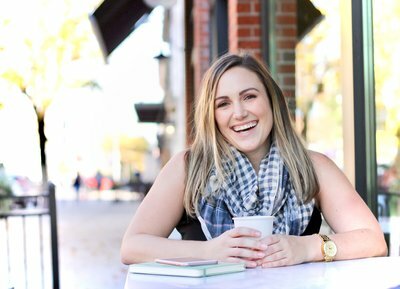 I was certain video would be a highly effective way of connecting with you and building my coaching business, but I’d occupy myself with other tasks and never get around to the video. Eventually, I realized I was avoiding and resisting the very thing that would have a much bigger impact than all the little tasks I was staying busy with (like tweaking my website and countless other things). Here’s the thing… going outside our comfort zone can make us feel nervous and uncertain, but it’s also where so much incredible growth happens!! I still experience resistance all the time, only now I know how to catch myself and reframe my mindset so that I don’t hold myself back as much or feel as frustrated. And if it’s something I discover I truly don’t want to do, I figure that out more quickly and give myself permission to move on and take other action. Is it possible what you’re feeling is actually excitement more so than fear? Often, the very thing that kind of scares us a bit (in that butterfly kind of way) is also the thing that deep down we KNOW is our next growth opportunity. In that sense, you could think of it like a sign to keep going head-on in that direction! I truly believe the things that excite us – that light a fire in us and are worthy of giving us those butterflies – are not random. There’s a reason we’re drawn to them! And those butterflies can be a sign that we really care. So, instead of panicking at the first sign of them and assuming it means you should stop and scrap what you’re doing – or getting frustrated and harsh with yourself – pause and get curious. Check in with yourself about what is true. Take time to go inward. Take some deep breaths, meditate, go for a walk, or do whatever it is that you do to center yourself. Connect with your inner wisdom. Ask yourself whether this is something you truly want to do and it’s just those excited/nervous butterflies or if this action truly feels like the wrong thing for you right now. Here’s what I know to be true: You can trust yourself!! Deep down, you know what is true for you! It’s a matter of getting quiet with yourself and giving yourself enough space and freedom to connect with your inner knowing, trusting that you know the answer. That’s hard to do when you’re avoiding, staying super busy, or beating yourself up over not taking action. So, take some space and be kind to yourself about the resistance you’re experiencing. With that clarity, move forward–one way or another! Don’t get stuck in the place of fear, doubt, or avoidance. Either decide to jump swiftly into the action you’ve been avoiding (like ripping off a bandaid) or move on to something else that actually does excite you. Keep in mind, things are often a lot less scary once we do them than we imagine. You’ve got to get out of your head and into action! Once I did my first few videos, I was so glad I went for it and couldn’t believe all the time I wasted resisting them. One trick I used was to tell myself my first few could be just for practice–that way I got into action mode without the pressure of making it good. From there, it was so much easier to do more! The more you practice listening to your intuition and taking action outside your comfort zone, the easier and quicker it becomes to move through resistance and on to what you want! Later, when you look back at what was once outsize your comfort zone, you may be surprised to see how much you’ve grown and expanded! Either way, you’ll be so glad you moved forward. Now, I’d love to hear from you! What have you been resisting that you know is the next big growth step for you? Let me know in the comments below!